Before making the decision to invest into a solar solution, there is an obvious legitimate question to ask: How much energy saving (expressed in KW.h) will my investment generate? And how long will it take me to get back my money (payback period)? This blog will deal with investment energy annual output. The payback period will be addressed in a separate article or blog. What do my Annual Saving depend on? 1. Location of Solar Collector (defined by your location's Longitude and Latitude). 2. Collector’s Solar Azimuth, which is nothing more than deviation from the south direction. 3. Collector’s tilt angle from the horizontal surface (or even a flat roof surface). 4. Fluid’s temperature inlet to the solar collector (23°C here). For fluids (Water, Glycol, etc...) temperatures other than 23°C, please contact our technical team @ admin@hydrosolar.ca or simply call us @ +1 (888) 686 7652. Since southern oriented areas are always sunny, it’s always wise to have solar collectors facing south (means a zero Azimuth) or an absolute value of the Collector’s Azimuth as close as possible to zero. 1- Optimal Tilt Angle for a maximum winter heating energy output is between 65 and 75° (depending on location and operational conditions - The rule of Thumb is Latitude plus 15.6 Degree). This becomes very useful if produced fluid heating energy is used for hydronic space heating (such as radiant hydronic floor heating, process heating, etc.…). 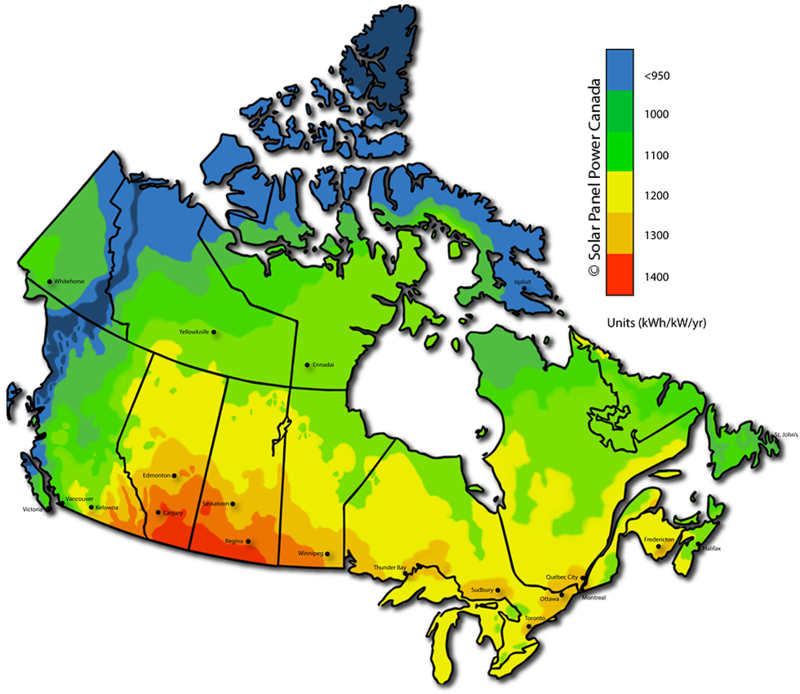 2- Optimal Tilt Angle for a maximum summer heating energy output is between 25 and 35° (depending on location and operational conditions - The rule of Thumb is Latitude minus 15.6 Degree). This type of installation is very common in outdoor pools heating and other summer outdoor activities requiring low to medium temperature hot waters. --1.a. If you live in a major Canadian city (such as the one listed in XIANKE 20 Tubes Panels Heat Output, XIANKE 25 Tubes Panels Heat Output, XIANKE 30 Tubes Panels Heat Output), please go to 2. --1.b. If not, please choose the nearest major city to your location among the one listed in XIANKE 20 Tubes Panels Heat Output, XIANKE 25 Tubes Panels Heat Output, XIANKE 30 Tubes Panels Heat Output. ----1.b.i. If the nearest found city is within 20 Km from your location please go to 2. 2- Determine your Solar Azimuth: Place a compass (it could be as simple as using the compass app in your smartphone) in a horizontal position perpendicular to the southern facing part of your inclined roof. Write down the angle. It’s you future solar collector’s azimuth (Azimuth value is positive when collector is facing south‐west direction and negative when facing south‐east direction). 3- Determine your Tilt Angle: for inclined roof installations, the tilt angle is your roof angle. You can either measure it with laser measurement instrument of calculate the angle by using trigonometric formulas. Once the above are known, please go toXIANKE 20 Tubes Panels Heat Output, XIANKE 25 Tubes Panels Heat Output, XIANKE 30 Tubes Panels Heat Output), locate your city, Azimuth and Tilt angle and write down the Annual KW.h of generated for each Solar Panel. Total Annual Saving is the sum of all Panels Individual Savings. Hello Odin Donald. Calculating energy saving from solar installation isn’t an easy task. that’s why we take the hassle of technical difficulty for our client for free. Please fill this form (https://hydrosolar.ca/pages/solar-domestic-water-heater-sizing-request) and we will let you know, based on you location, what you need to install, how and how much saving will your investment generate.